Let's just say it up front so that nobody skimming the review will miss it: Power Rangers Megaforce is a terrible game. Not only that, it's actually broken in several respects. And we don't mean "broken" to mean "unfair" or "poorly designed." We mean "broken" to mean "it does not work." The concept of the game is promising enough, if not particularly inspired: you swap between the five colour-coded Rangers to stop some villains from doing some villainous things. What things? It doesn't matter, because the only solution to any problems that your Rangers face is to punch them to death. That's okay, however. 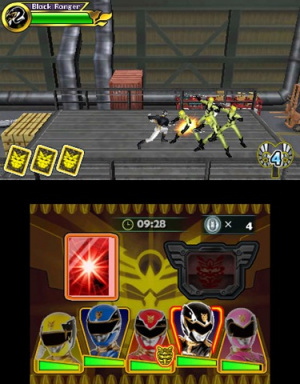 Power Rangers Megaforce is a beat-em-up, and that's a genre that often flourishes in addictive simplicity. This is, by contrast, a game that mires itself in over-complication and then just seems to give up without seeing its own concepts through. Each of the game's five worlds are referred to as "episodes," and they each consist of either six or seven levels apiece. The levels are very short and never get particularly challenging, which adds up to a very short campaign. Even so, we'd be shocked if more than a handful of people on the entire planet bothered to play through to the end. You start each level by choosing a Ranger, and they each have distinct weapons, but the choice is moot because several times throughout each level the game will replace whatever Ranger you're using with another, seemingly without any reason for doing so. 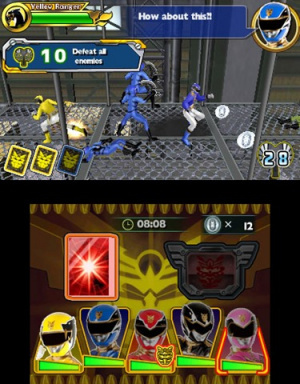 At other times you can cycle through your Rangers with the L and R buttons, but for whatever reason the game will force you to use one of its own choosing at arbitrary times, and you won't be able to switch to anybody else. The whole experience is a frustratingly repetitive slog through identical enemies that patiently wait for you to walk up and kill them. Each level consists of a few hordes of foes that just sort of hang around until you pay them a visit. In what has to be the most ludicrous possible attempt to inject variety, every so often the game's already terrible pacing is further interrupted by an objective, such as gathering medals or retrieving a card. To put into perspective just how silly this is, imagine playing Super Mario Bros. and having the game freeze every few steps so that some text can scroll onto the screen, reading COLLECT A FIRE FLOWER or GATHER THREE COINS. Also, there's no time limit in which to accomplish this. Oh, and the fire flower or the coins are in a tight corridor and it's literally impossible to not collect them as you advance. Then, after you do that, you take another few steps and find the game interrupted by another pointless objective. 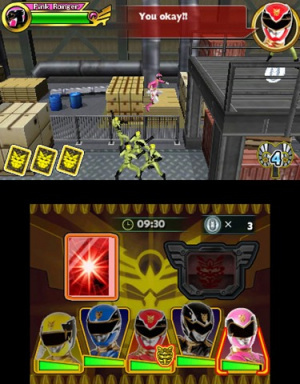 If that sounds like fun, then Power Rangers Megaforce is absolutely the game for you. That would all be bad enough, but there are also sound-bites that play endlessly throughout the game. While the fact that every line of dialogue has voice acting might seem like a nice selling point for fans, it's far more of a punishment than any kind of bonus. The Rangers all shout things throughout every level, with no quiet space at all between their invectives. It amounts to the same two or three sentences being screamed at you in rapid succession, over and over again; we have to assume it's a glitch in the playback coding because there is no reason that any sane person would program a cacophony like this on purpose. 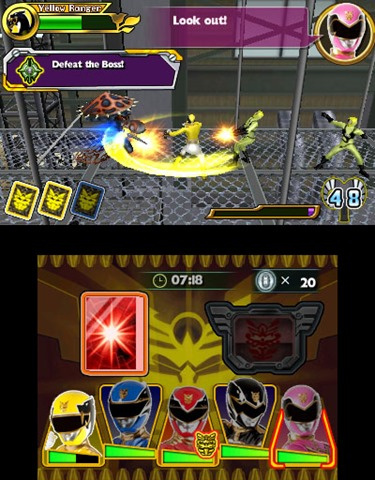 The Rangers shout at you to fight enemies, pick up medals and avoid damage, all of which is taught by the game's mandatory tutorial, and none of which needs to be repeated ad nauseum throughout the whole of every stage without a break. Our favorite example of this happened early on, when the Rangers pleaded endlessly with us to break open a box that wasn't even there. It either failed to spawn or the wrong dialogue clips were being used in that room. Either way, we still hear their desperate cries for box-breaking in our nightmares. Such is the personal sacrifice we make for you, dear readers, here at Nintendo Life. That's not the only problem with the basic gameplay, either. The main draw of Power Rangers Megaforce is its "card" mechanic. This works in two ways: within the game (as you find cards in the levels you explore) and outside of the game (as you scan physical cards with your 3DS). In the case of the former, you'll find a power card lying somewhere, which you can then activate with the touch screen. It's typically a stronger, wider attack, and while it works well against the hordes of enemies you'll encounter so often, the fact that it always triggers an annoying and unskippable cut-scene and then a long attack animation means it's often quicker to just beat everyone to death with your fists anyway. Outside of the game, the physical cards fare even worse. 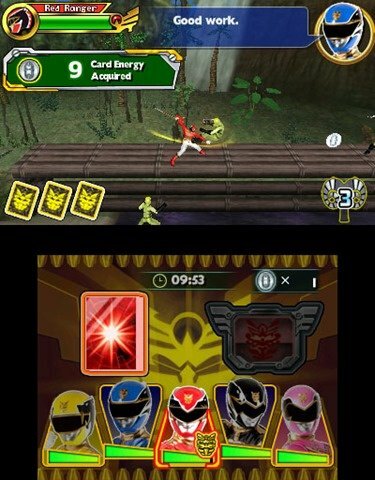 Each copy of the Power Rangers Megaforce comes with its own exclusive trading card for you to scan, but try as we might, we couldn't get the game to recognise it. We tried it on a variety of surfaces, under a variety of lighting conditions. We tried every distance and angle imaginable. We lined the card up absolutely perfectly with the outline on the screen. And yet it never recognized that a card was there. For that reason, we can't even tell you what the feature is meant to do. Unless, of course, it's just meant to make you shout profanities at a trading card — in which case it works fabulously. We have to conclude that the scanning functionality is simply broken; nothing we did worked at all. Further suggesting this is the fact that if you close your 3DS while playing the game, there's about a one in three chance that the game will crash rather than pause as it's supposed to. That may sound like a bad thing, but it stops you from playing Power Rangers Megaforce so it's therefore our favourite feature in the entire game. The graphics are passable, but they're certainly a bit simple and lifeless. There is a very silly — and oddly mandatory — feature that asks you to take a photograph of yourself, so that when you start a level you can see yourself morphing into an actual Ranger. Well, at least in the same sense that sticking your head through a hole in one of those painted photo boards "morphs" you into a beautiful woman in a swimsuit. We'd love to be able to tell you what we thought of the game's soundtrack, but we couldn't hear any of it over the sounds of the Rangers screaming at us. Power Rangers Megaforce isn't just a bad game — though it most assuredly is a bad game — it's downright broken in places. While the license and fully-voiced dialogue might rope in fans of the show, there's no escaping the fact that this should not have seen a retail release in its current form. The game crashes, the card-scanning feature doesn't work and the sound-bites loop long beyond the point of insanity, very quickly becoming the video game equivalent of "Stop hitting yourself." No attention has been paid by the developers to how the game actually plays, and it seems as though no attempt was made to correct its many problems. If you happen to see Power Rangers Megaforce on the shelves, don't make eye contact — you'll only get its hopes up. Its as good as the actual show then! Aye-yi-yi-yi-yi @Philip_J_Reed. I'm sorry you had to play through this garbage. Did you play through the entire game? 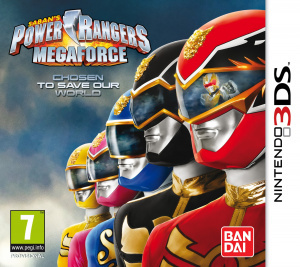 Wasn't it Power Rangers Samurai on the DS that scored a 7/10 two years back? What is it with the flood of shovelware devs invading the system this year?! I really wish Nintendo would start to enforce some quality control so lazy devs can't just waltz in with their half-baked crap. And also, if the graphics are "bland and lifeless," shouldn't that qualify them as not passable??? I mean come on, it looks like a DS game! Yikes! This game doesn't sound very fun at all! "Either way, we still hear their desperate cries for box-breaking in our nightmares. Such is the personal sacrifice we make for you, dear readers, here at Nintendo Life." Oh man, that made me crack up. I feel terrible for laughing at someone's misery, but at least we all know never to touch this game. God bless Nintendo Life. wow that is really dreadful! My sides! If you've got me singing the tagline in my head, that's a good thing! In Mighty Morphin, the japanese sentai footage looked fantastic, here....it's just sloppy & boring. At least they're bringing back tommy for the giant battle, gives me a reason to actually tune in. Oh, and that Voodoo head zordon replacement? just USELESS. he's barely in the show for crying out loud and gives out the most useless advice, spewing out spiritual nonsense left and right. ugh. It's still better than Samurai though! 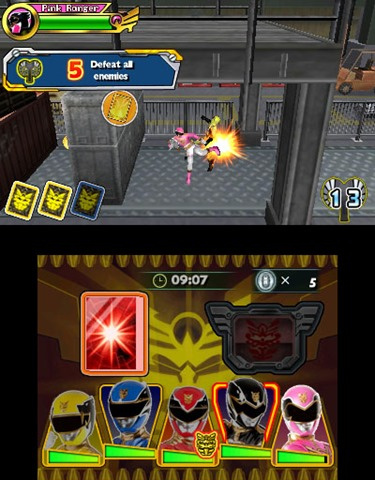 "That may sound like a bad thing, but it stops you from playing Power Rangers Megaforce so it's therefore our favourite feature in the entire game." Must get this game. Will win GOTY for sure! LOL A friend of mine who is a huge Power Rangers geek preordered this. @andreoni79 That was my favorite part of the review too! Another hilarious review from Phil! Great work, man. I'm sorry you always get stuck with the bombs though. @Philip_J_Reed Is this your Christmas present? We have ourselves selfs a GOTY & System seller here gais, everybody got nuts! @andreoni79 Thats proof alone its GOTY worthy. Power Rangers games had become a joke gen after gen, it seems the only good PR games were those for the Super NES and Sega Genesis. Why did you review this Philip? Lose a bet? @CountWavula First off, leave the rose colored glasses at the door. While I love MMPR and Power Rangers in general, I cannot say that MMPR is the "best series EVER". Much like any season in any series, it had its faults. Megaforce definetly has its problems, but some of them can be looked past just like those in the original series. PS Jason not best Red Ranger. Tommy is. Followed by Andros. @Knuckles: I believe it did get a 7/10. I have the DS game and it was decent. But yes, Nostalgia is obviously a humungo key component here, i was about 9 when MM paved the way and it was my world for 1-2 years. It was fresh, something that i've never experienced before. And it RULED the world, it was everywhere on TV and made a giant splash in america. Zero and the others didn't have this effect at all. Anyhoo after MM was over after over staying it's welcome, i also tuned in for practically every episode of Zero(what a let dissapointment), Turbo(good lord....Although i did like Devatox), In Space, Lost Galaxy(just awful) and Light Speed Rescue(titanium ranger doesn't hold a candle to evil green. ) and that's where i stopped cold turkey. I've seen several episodes of the other 1 million something ranger 'whatevers' on Netflex and most of them just seem dissapointing, samurai i'd say is one of the worst....including Mystic force ect ect. Also, i'm not that big a fan of 'good' tommy, he's overly nice to the point of looking phony. His performance as evil tommy & the green ranger was pretty fantastic though. Wasn't a huge fan of andros, although he's light years better than Troy from Mega force haha. In Space was one of the better ones, no doubt. @KnightRider666 Thanks. I might consider buying that game if I ever see it cheap enough. @Knuckles: How cheap? FYI: GameStop sells it for $20 new, $18 used. People, when you say GOTY you mean Garbage of the Year, right? @KnightRider666 Thats cheap enough for an old fan of the overall series like myself. If I see it next time I'm at a gamestop I'll buy it, thanks! @Knuckles: No problem. You're welcome to check amazon & ebay as well. @DarkwingLz: The NintendoLife staff team should buy Phil this for Christmas, then record his unwrapping reactions, & upload it to Youtube. On the other hand, for enduring garbage games, Phil needs good games instead. I wasn't the least interested in this, but thanks for the laughs Phil, & NintendoLife, which is why I clicked this review to begin with. Also, NintendoLife, thanks for the PR fans that visit this site(though I am not one of them) that now have an idea of how a game based on a favorite license of their's fairs. I'm sure those fans appreciate it.